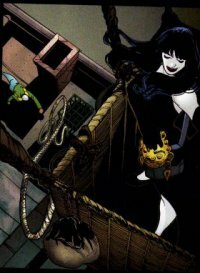 Nocturna is an expert burglar and tactician with no skin pigment and a penchant for hot air balloons. Stephanie spotted her robbing a place as she was on her way to pick her Mom up from work in her civvies. Stephanie noted Nocturna hadn't been seen in a while, and had last been arrested in New Orleans. Despite having been told by Tim not to be Spoiler anymore, Stephanie sprung into action. Nocturna was taking off in her hot air balloon with the stolen item, but Steph retied the rope attached to the balloon to a grating, stopping the balloon mid take off. She was so quick, Nocturna didn't even see her do this, only noticed that her balloon had suddenly been grounded. Tim came to collect Nocturna (Stephanie hid from him), and the successful capture of the crook helped Stephanie realize she still wanted to be Spoiler, no matter what Tim said. Later, Stephanie was back to being Spoiler and she spotted Nocturna trying to rob the Robinson Ball, and after alerting 911, went after her, grumbling about the police not being able to arrest someone trapped in a hot air balloon. She told Nocturna she should have stuck to balloons and made fun of Nocturna's dramatic way of talking. Nocturna sank into the shadows, which Steph remarked, "wasn't on her facebook page". Then she reappeared behind Stephanie through a dark portal, leaping at her with a knife. Steph agiley dodged this, and Nocturna stumbled. Steph informed Nocturna she was under arrest, and saying that Nocturna was not the only "old dog with new tricks", Steph demonstrated to the crook that she now had the power of invisibility, thanks to technology she nabbed. Nocturna was taken away by the police, thanks to Steph's efforts.